Incumbent governor enjoys robust approval rating, but opponents say delegates remain decidedly lukewarm. TRENT NELSON | Tribune File Photo Gov. Gary Herbert Tribune file photo Utah Gov. Gary Herbert. Heading into Saturday's state Republican convention, Gov. 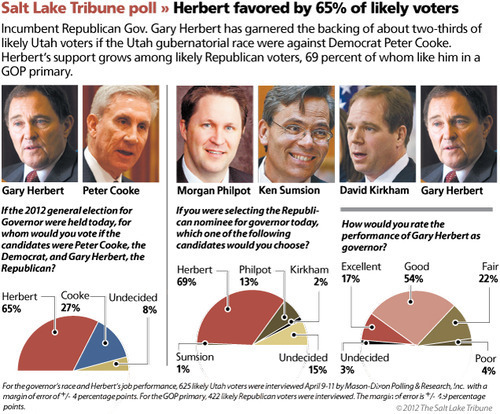 Gary Herbert boasts a solid approval rating from Utahns and would be the leading choice of Republican voters if there is a primary in the contest, according to a new poll. But Herbert's challengers argue that the polls don't count and it will be Republican delegates  many of whom they say are lukewarm toward the governor  who will decide the party's nominee. The poll, conducted for The Salt Lake Tribune, found that 71 percent of Utah voters approve of the job Herbert has done as governor  with 17 percent rating his job as "excellent" and 54 percent rating his performance as "good." "It's encouraging to see that people across the state support the governor," said Scott Ericson, Herbert's campaign manager. "Obviously, because they're not delegates, they show a representation of all over the state and we'll have to wait until we see the delegate vote come in." A poll released Tuesday by the Utah Foundation showed Herbert right on the cusp of clinching the Republican nomination on Saturday, with just over 60 percent of delegates backing the governor. The Tribune survey of primary voters showed he is perhaps even stronger in a primary contest. If the primary election were held today, 69 percent of likely GOP voters said they would support Herbert. Thirteen percent back former state Rep. Morgan Philpot, while 2 percent support tea party organizer David Kirkham and 1 percent would vote for Rep. Ken Sumsion. Fifteen percent are undecided. Philpot said that so far the campaigns have focused on the Republican delegates, and those who have heard the case don't support the governor. He said rather than fight "Obamacare," Herbert has taken the federal money to implement the health reform. And, Philpot said, the governor has sided with President Barack Obama's administration in promoting Common Core standards for Utah schools and has accepted federal stimulus money. "If this race does go to a primary and conservative Utah voters learn [his record], the issue won't be whether he has a lead in the polls, it will be whether he can possibly get re-elected at all," Philpot said. Kirkham said his campaign has been working hard to peel off one delegate at a time. "We're pushing really hard to get to a primary," Kirkham said. "We always knew this is an uphill battle," said Kirkham. "But it's a battle worth fighting. There are important issues that need to be brought to the voters, like the extremely high [state] debt, doubling the amount of debt in the past two years." He said cities, counties and school districts are tired of mandates from the state and that needs to change. 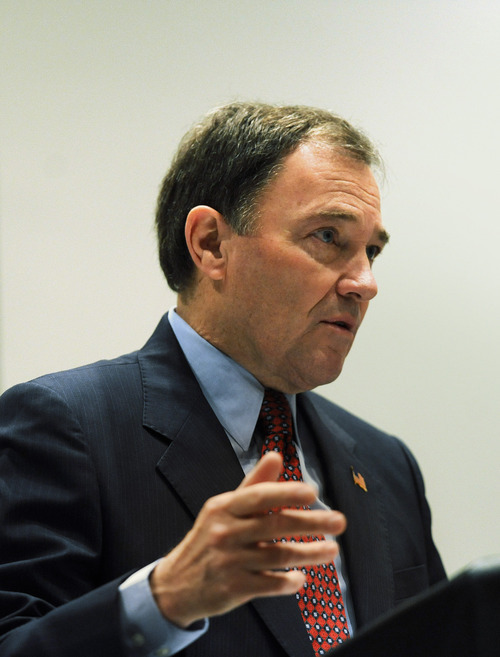 Tim Chambless, with the Hinckley Institute of Politics at the University of Utah, said Herbert's support has increased since he took office for a few reasons. "The power of incumbency has to be an advantage," Chambless said. Additionally, Herbert has "benefited from a national wave of pulling slowly out of this longest-ever, deepest-ever post-World War II recession … so his timing politically as he runs for a full four-year term is good." 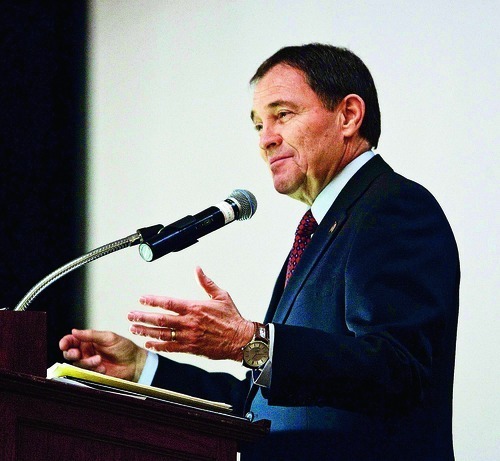 Herbert's statewide approval rating was drawn from a poll of 625 likely Utah voters conducted by Mason-Dixon Polling & Research, and has a margin of error of 4 percent. The GOP primary poll surveyed 422 likely Republican primary voters and had a margin of error of 4.9 percent.